Kaizen. Change for the better. Continuous Improvement. Is it a tool? Is it a mindset? Ever since academics, at first in Japan then in the West, tried to understand what Toyota started doing in the 20th century that made it different has the word Kaizen been gaining recognition. KAIZEN. CHANGE FOR THE BETTER. CONTINUOUS IMPROVEMENT. IS IT A TOOL? IS IT A MINDSET? Ever since academics, at first in Japan then in the West, tried to understand what Toyota started doing in the 20th century that made it different has the word Kaizen been gaining recognition. As more people from all walks of life, be it business leaders, team supervisors, management consultants, life coaches, thought leaders, etc… tried to interpret Kaizen and develop it into a set of tools, methodologies and philosophies the more variations in its definitions arose and hence more confusion about what Kaizen really stands for. 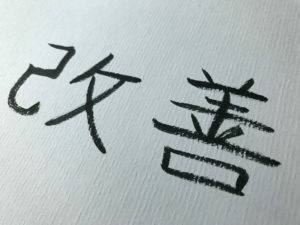 1 Let’s start with the literal dictionary translation of Kaizen, 改善. In the Japanese language the word Kaizen is derived from two Kanji, the first ‘Kai’ 改, meaning ‘change,’ and the second ‘zen’ 善, meaning ‘good.’ Hence the literal meaning of the word being ‘change for the better’ i.e. improvement. So the average Japanese would use the word Kaizen to express improvement. Notice there is no reference to this improvement being continuous or in small steps or being part of a philosophy or mindset. Kaizen, 改善, continuous improvement in small, sometimes referred to as ‘baby,’ steps. This is were either a team or an individual, daily or in repeatedly occurring workshops, constantly challenge their immediate work environment by looking to eliminate waste (Muda, 無駄), unevenness (Mura, 斑), and overburden (Muri, 無理) by implementing a series of continuous incremental minor improvement steps in their workplace. Kaikaku, 改革, meaning radical or revolutionary change and in its extreme can also be referred to as kakushin, 革新, literally meaning renewal however referred to in business English as innovation or disruption. This applies to challenges where the sum of all incremental Kaizen steps would still not suffice to solve the problem. Examples of Kaikaku and Kakushin from Toyota’s own history are the introduction of a luxury premium brand called Lexus to compete in that segment initially in the Western markets where the Toyota brand on its own could not capture market share successfully from European premium brands, or the introduction of the Prius hybrid vehicle back in 1997 to address challenges arising from environmentally conscious customers’ needs. Iji, 維持, meaning sustainability. This is the most difficult of the three elements and a pre-requisite for Kaizen as said by Taiichi Ohno himself: ‘without standards there can be no Kaizen.’ This state refers to an organization being able to sustain any improvement it accomplishes as a foundation for the next improvement push. If an organization is resistant to change for the better and always falls back to its original state then it cannot sustain any change and hence any effort put into driving Kaizen would be for naught. 3 The third understanding of Kaizen, 改善, refers to the Kaizen philosophy. This is the philosophy or mindset that Toyota started developing since its inception as a textile loom works company under its founder Sakichi Toyoda, then evolved further when Sakichi’s son, Kicihiro Toyoda, changed the company’s focus from textile to automotive manufacturing and moved one of the textile production engineers, Taiichi Ohno, to become the production manager of the automotive manufacturing business and would also be known as the father of the Toyota Production System, TPS. In the 1950’s and 60’s Japanese academics and business leaders noticed that Toyota was working differently from other manufacturers with far better results. This interest sparked academics to partner with Toyota to study its culture and way of working and would later be referred to in Japan as Toyota’s Kaizen mindset, 改善の考え方. Almost two decades later Western academics, most notably Womack and Jones, would also extensively research Toyota’s culture and way of working and would name this Toyota Kaizen mindset, Lean. Lean was coined the best term since it refers to an organisation like a body, where a healthy one is lean and with little fat versus an unhealthy organization that has lots of waste or Muda, 無駄. Hence the terms Lean Management or Lean Thinking. Later in 2001, as Toyota started its rapid global expansion and wanted to document its culture in a way that its people can refer to when they went outside of Japan to set up production plants around the world it set out to record its culture, which until then was passed down verbally and on the job training by one generation after the other since the times of Taiichi Ohno. This resulted in an internal document called ‘The Toyota Way 2001,’ トヨタウェイ2001. The year 2001 was intentionally written as part of that document to deliver the message that the version documented in 2001 is not static and must evolve and develop. This mindset however, the Kaizen mindset that Toyota in Japan was known for and what the West called Lean Management, is what Toyota finally labeled as the Toyota Way, トヨタウェイ. Over the next few years all the divisions in Toyota adapted and documented the Toyota pertaining to their areas such as the Toyota Way in R&D and the Toyota Way in Sales & Marketing. It is this third definition, the Toyota Way, トヨタウェイ i.e. Lean Management that Four Principles aspires to help its clients inject into their organization’s culture and operations through our various tailored hands-on approaches.